up to 50% on your phone bill. traditional phone lines and start saving. Are you still using traditional phone lines? Are you getting tired of paying high-priced phone bills every month as well as excessive fees and taxes from the phone company? VoIP phone systems are the wave of the future, with many small and large businesses alike using SIP Trunking for all of their communication needs. With a traditional phone system, your phone lines are connected through a PBX system. That system is connected to the PSTN, or Public Switch Telephone Network, via analog lines. If the business is using Internet, as most businesses do, these connections are created separately. SIP Trunking allows the business owner to remove the cumbersome phone lines and have one streamlined system. The system uses the same lines as your Internet to connect your PBX network. Instead of being forced to buy a standard package, customers only buy what they need and can add additional lines later for a low fee. Many customers save as much as 70 percent off their phone bills. Learning how to use and service a traditional communications system can be quite time consuming. In addition, many of these systems are limited in capabilities. 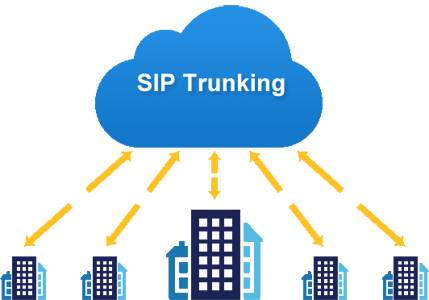 Changing over to SIP Trunking eliminates many of the challenges business owners face with traditional phone lines. All businesses can benefit from improved communications. Many of the features available using VoIP phone systems are significant upgrades from traditional phone systems. Because this communications system is run through the Internet and not traditional phone lines, many of the obstacles for direct communication, such as direct messaging, are eliminated. At the same time, production of all staff increases because of the ease of use of the system. They are not wasting time reading manuals and watching training tapes because these systems are so easy to use.